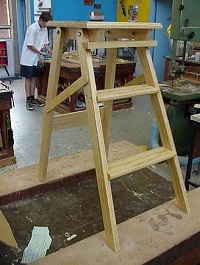 This is a practical course where students work with wood in the design and manufacture of products. This is also a course about ideas, innovation and creativity. In order to do these well, students research and test materials and use strategies to develop innovative and creative ideas. They apply skills of management in planning and implementing a process, at the same time as they manipulate tools and machines to produce high-quality products. Wood Design is an excellent introduction to developing valuable skills for personal development or pursuing a trade qualification. It is an introductory unit for those students who have limited experience in the manufacturing of products. The course provides opportunity for students to experience practical and functional furniture making with creative and useful outcomes. The focus for this unit is Production Fundamentals. The knowledge, skills and tasks in the course can be used for leisure time activities or in planning a career working with wood and furniture. Throughout the process, students learn about materials, including their origins, classifications, properties and suitability for purpose, pride of achievement, and the knowledge and application of the correct use of tools, machines and materials. Further education, training and employment opportunities within this industry are greatly enhanced for students completing this course. Opportunities may include apprenticeships, traineeships, scholarships, credit entry to State Trading Providers (TAFEWA), University entry and a range of direct employment options for example: Cabinet Maker; Finisher and Shop Fitter. Students may be expected to complete a Personal Project during second semester. Cost of structural materials will need to be covered by the student and can vary from upwards of $20 depending on the resources and requirements of the individual student.